Hello all you Ketonians! 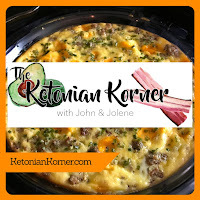 (and future Ketonians) The Ketonian Korner is hosted by Jolene Hale and John Davidson. Our forum is a round table discussions at our place of work. Sometimes we have people present in the room as well as on the phone and sometime it's a pre-recorded interview on the weekly discussion topic. Go to Jo~Jo's Kitchen and order your Keto friendly cake and bread dry mixes.If you have any questions please be sure to leave us a comment and we will answer your questions or point you to the research/article that can help you. If you wish to suggest topics, give us feedback on our approach or just simply let us know what you think...please leave us a comment. We would love to hear from you!